NASA and SpaceX engineers are working together at NASA’s Kennedy Space Center in Florida to build a full-scale Crew Dragon model, or Recovery Trainer, that will be used by the U.S. Air Force to perform flight-like rescue and recovery training exercises in the open ocean later this year. 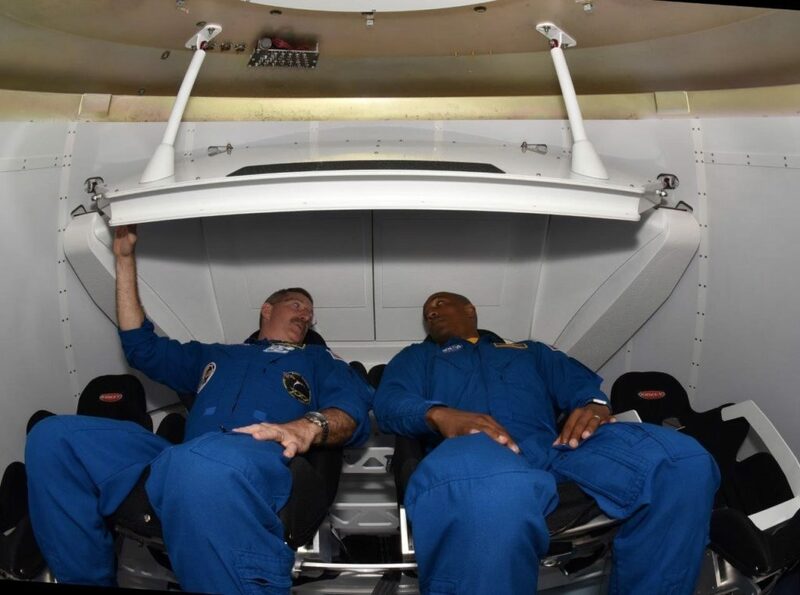 The model, shown above with astronauts Dan Burbank and Victor Glover inside, is built to mimic the Crew Dragon spacecraft that SpaceX is developing with NASA’s Commercial Crew Program to fly astronauts to and from the International Space Station. In certain unusual recovery situations, SpaceX may need to work with the U.S. Air Force to send parajumpers to recover astronauts from the capsule. The Recovery Trainer will be used by the Air Force to prepare procedures and train for this contingency scenario. The trainer also has two working hatches and other simulated components similar to the ones astronauts and support teams will encounter in real missions. Scott Colloredo, deputy director of Kennedy’s Engineering Directorate, said the engineers adapted SpaceX designs of internal elements to be compatible with the trainer and worked with Kennedy’s Prototype Development Lab to produce the parts quickly and install them inside the trainer. The Prototype Development Lab designs, fabricates and tests prototypes, test articles and test support equipment. The lab has a long history of providing fast solutions to complex operations problems. The lab’s teams of engineers use specialized equipment to produce exacting, one-of-a-kind items made from a range of materials depending on the design. SpaceX is now finalizing modifications to the trainer to ensure it floats in water in the same way as the Crew Dragon spacecraft. Following those modifications, the trainer will enter service as the primary training vehicle for Crew Dragon astronaut recovery operations.